Haba - Marble base box dominoThis ball track basic box domino is a beautiful combination box of a marble track and building blocks. Let your little one play, discover and think. In this box you will find 61 colored dominoes, 8 blocks of untreated wood, 6 building block clamps, 2 wheel clamps, 2 blade wheels, 2 metal rods with eyes and 6 marbles. Haba building systems including marble track, building kits and technology components can be perfectly combined with each other. 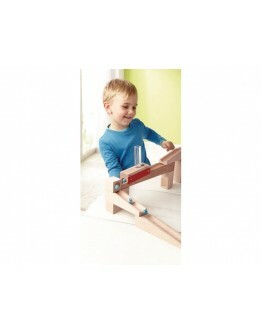 This game promotes -..
Haba - Marble track expansion tubeIn this storage tube you can collect marbles and let them roll in your marble track. 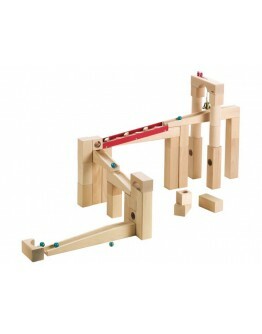 There is also an extra extension available so you can easily place on other parts of your marble track. 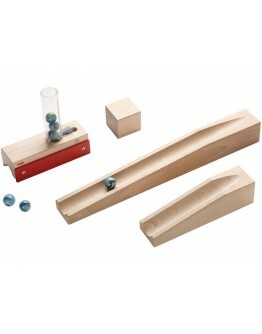 In this box you will find 1 storage tube, 2 slopes, 1 cube and 6 marbles. Haba building systems including marble track, building kits and technology components can be perfectly combined with each other. 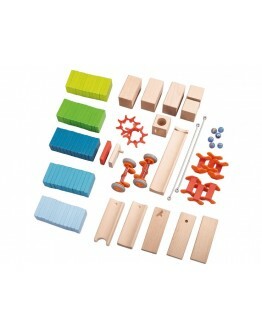 This game promotes -Spatial thinking -patience and fine motor skills ..
Haba - Marble track large base boxThis Haba large kit pack marble track with 42 solid beech wood pieces in a large base box contains 6 glass marbles and a bell at the finish. You will also find 1 zigzag track, 1 bridge with bell, 4 reversing blocks, 2 tunnel stones, 4 ramps, 14 beams, 8 cubes, 2 bridge sections and 6 columns in this box. All Haba building systems including building blocks, marble track and engineering components can be perfectly combined with each other. This game promotes -s..